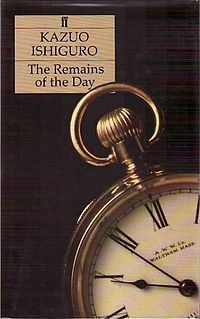 I’ve recently been re-reading Kazuo Ishiguro’s masterpiece The Remains of the Day. For those unfamiliar with the story, it concerns an English butler Stevens, who during the 1950s looks back over his years of service in Darlington Hall. During this time he and the housekeeper Miss Kenton were obviously attracted to one another but Stevens kept her at arms length, fearing that any relationship would somehow constitute a dereliction of duty to his master Lord Darlington. Matters are complicated by the fact that Darlington became involved in Nazi appeasement, and as Stevens looks back he begins to wonder whether his loyalty was in fact misplaced. I am a huge fan of both the book and the film, but I had not read the book for some time and was genuinely surprised at how different it was to the film. Why had I so misremembered it? The answer perhaps lies in that crucial adaptation adage that it is less important to be true to the precise content of a book, and more important that the spirit of the novel be alive and well. This is obviously true of, say, Peter Jackson’s films of The Lord of the Rings. They are often different in incident to the books, but they feel like they are the same work, because they are true to what was important to Tolkien. Firstly, the character of Stevens’ father is much more important in the novel. A huge part of Stevens’ complex character derives from what he learned from him, most critically his definition of “dignity”. There is far more background detail about his father’s ideals, incidents from his past, and a sense that this paternal figure exerts a very strong influence over Stevens even after he is dead. Secondly, many key incidents that take place during Stevens’ journey to the West Country occur in different locations to the film, such as his Apostle Peter-like denials of association with Lord Darlington. Because the nature of the English countryside is one of Stevens’ most memorable asides in the novel, this detail becomes important. The reasons for his admiration of said countryside provide a vitally important clue as to his character and motivations, so the scenery isn’t merely there to be pretty. Thirdly, I had forgotten that Stevens’ present master, the American Mr Faraday, is an entirely different person to the American Mr Lewis who turns up at Lord Darlington’s conference in between world wars. In the film, Mr Faraday is not included. They simply have Mr Lewis fulfil his role instead. But the Mr Lewis of the novel is a much more ambiguous character; a more underhand man whose methods are called into very serious question by his fellow guests, in spite of the fact that he is obviously ultimately proved correct in his distrust of the Nazi regime. Most fascinatingly, the finale (which takes place in Weymouth, unlike the film), contains a full-on breakdown, where Stevens talks to a total stranger lamenting the loss of the woman he loved. He is also forced to confront the fact that he has given his best years of service to a man who didn’t deserve them. This scene was filmed, but crucially removed from the finished cut of the film (it can be seen on the deleted scenes in certain DVD/Blu-ray releases). I think James Ivory was absolutely right to keep it out of the film as everything the scene contains is inherent in the stunning performance Anthony Hopkins gives elsewhere. But the book is a different matter. In the book it is a critically important moment essential to the narrative. Stevens’ absurdly repressed nature is often comical, but the genius of both the novel and the film is that we are gradually taken from laughter to tears. This is – above all – a tragic tale of wasted lives; of a man who knows his place and keeps it at the expense of his own convictions and happiness. I’d highly recommend both the book and the film if you haven’t read/seen either, but to return to my original point, The Remains of the Day provides an excellent example of how it is less important in the adaptation process to remain true to the incidents of a novel and far more important to remain true to the spirit. If one considers the alternative – for example the slavishly faithful yet ultimately rather mediocre film of Harry Potter and the Philosopher’s Stone – the wisdom of this approach becomes clear.